It's a little known fact that 'webs' are a very versatile form of silken structure. You can 'sling' them. You can 'world-wide' them. 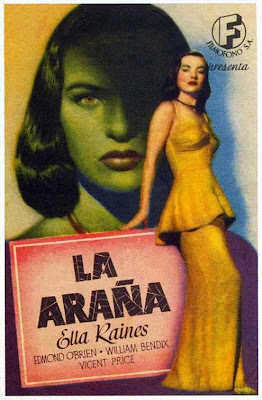 And you can make them into this film Directed by: Michael Gordon; and Starring: Ella Raines, Edmond O'Brien, and Vincent Price. It was devised in 1947, and lasts for 87-minutes. 'Come work for me' he said. 'Someone who stole from my rather large organisation has recently been released from prison, and he may want to get his revenge' he continued. And do you know what, folks? Like a sap I fell for his spiel hook line and sinker. Me: One-time lawyer / present-time bodyguard, Bob Regan (Edmond O'Brien). And Him: One-time businessman / present-time con-artist, Andrew Colby (Vincent Price). Granted, I didn't know Andrew was a con-man straight off the bat. No. Of course not. It was only after I shot the sap that stole from him in self-defense, that things didn't sit too well for yours truly. Well, the first person who made me see the light was my good friend, Lieutenant Damico (William Bendix), when he surmised that the sap I killed had no reason for his 'retribution', especially since he must still have the money he stole from Andrew hidden away somewhere. 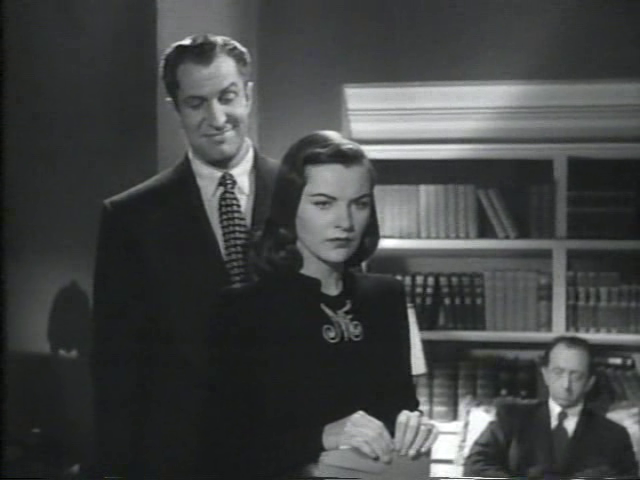 This was quickly followed by the second person who made me suspect something was going on, Andrews's lovely young secretary, Noel Faraday (Ella Raines), who inadvertently insinuated that Andrew was using her to figure out what I felt about my previous gun totting actions. Oh! Wait up. There was someone else I almost forgot to mention. It's the saps daughter. One night she crept into my apartment, gun in hand, and professed that her father was a good man by nature, and that it was Andrew who was 'pulling everybody's strings'. But then again, that's most probably why what next transpires all rolls around when I start to do some snooping. As love is neglected - a plan gets intercepted - a ploy ends in death - and at the end of the day Lieutenant Damico gives a quote from Macbeth. 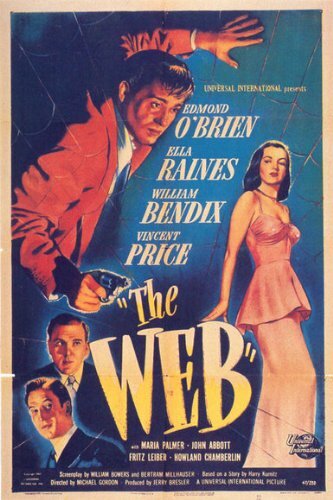 Now if I said to you 'The Web' was a 'great film', I wouldn't be doing it any justice whatsoever. It's better than great. It's marvelous. Magnificent even. And should be placed in a museum for everyone to gaze at, enamored by its brilliant brilliance. Alright. I know what you're thinking to yourself, folks. 'So why is this film so good you bloody idiot', right? Well, because its one of those timely classics that's got it all. Great actors. Atmospheric lighting. Artistic direction. A no-nonsense attitude. Plus an engaging and titivating plot that kept me on tender hooks right to the very end. Admittedly, on a conceptual level the story in itself may appear like a bog standard crime thriller. Act one: Stooge gets conned into protecting a businessman. Act two: Stooge figure's out that the businessman is a right b*stard, and has involved him in a bit of naughtiness. And Act three: Stooge tries to get himself out of this mess as best he can. Yet, whilst saying that, there were all those lovely little gems sprinkled throughout this film that made it all the more special by default. Like the gloss of the production for instance. Or how each of the characters was 'old school', charming, well spoken, and had that grittiness that'll make you want to buy a time machine on ebay. Yeah! I'm not messing about! This movie has so much going for it, I'm just amazed that it hasn't been mentioned or highlighted in the media like other classics have. Try to think of it as a cross-between 'Sin City' and 'Time cop', set in the forties, without any of that sci-fi stuff, and with all of that neo-noir style that this genre of production has in spades. Got it? Good. Next you can have the filmic-facts. (1) 'Universal International Pictures' first released this production in America on the 25th of May, 1947, and then in England four months later. 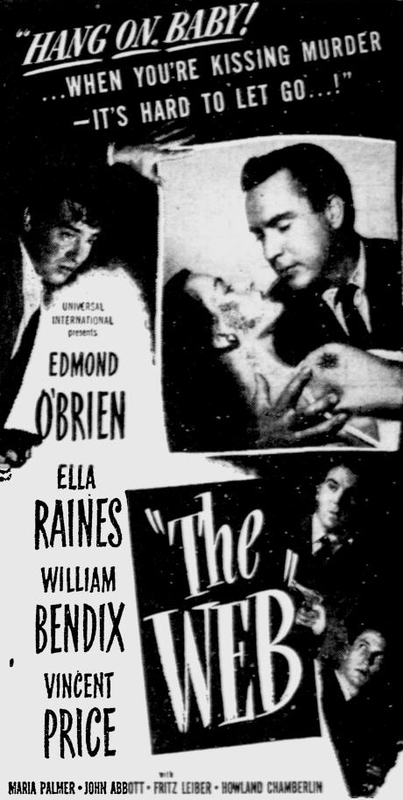 (2) This piece was adapted for the 'Lux Radio Theater' on the 29th of September, 1947, with Ella Raines, Vincent Price, and Edmond O'Brien, reprising their respective roles. (3) One of the writers on this film, William Bowers, played the 'Senate Committee Chairman' in the 1974 Francis Ford Coppola classic, 'Godfather Part II'. (4) During pre-production, this adventure was given the working titles of 'The Dark Web', 'Black Velvet', and 'Jeopardy'. (5) Michael Gordon, who directed this thriller, first film work was in 1942, when he directed the crime drama, 'Boston Blackie Goes Hollywood'. (6) Generally speaking this film received positive reviews when it was first released. William's performance was deemed 'smart but unsympathetic', whilst Vincent's performance was deemed 'elegant but sinister'. (7) The producer assigned to this film, Jerry Bresler, was also a songwriter, who famously composed the show-tune, 'Five Guys Named Moe'. (8) Loosely translated, this project was entitled 'The Network' in Germany, 'The Woman in the Net' in Denmark, and 'Passion that Kills' in Italy. 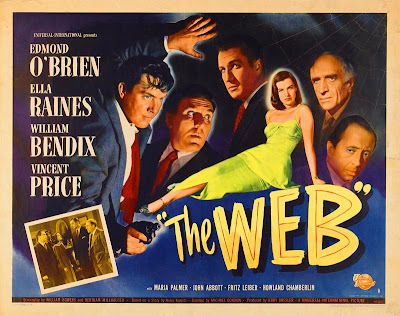 In closing, I would just like to mention how all of the actors in 'The Web' really helped it in both content and style. Vincent Prince played the sneaky villain like no man alive; and part of me would have liked to have seen him get away with his shenanigans because of his mannered charm. Ella Raines, on the other hand, is so adorable; I bet you anything she could kick Megan Fox into touch without even breaking a sweat. And as for Edmond O'Brien? Boy! What a hard-lined Sam spade that guy is! He was just like this film in fact. Bold. Honest. Intriguing. And a class act through and through. Nuff said. Now go and watch it. Ha!